Click here to watch a short video describing the services available to our member companies' employees and their family members. Counseling and problem-solving services. Everyone experiences problems from time to time and professional assistance can often help. Continuum helps people resolve issues in a variety of areas including: stress management, drug and alcohol abuse, communication and conflicts, marital and family difficulties, depression and anxiety, loss and grief, and many more. Work/life information and referral services. Continuum offers information, education and resources to help people achieve personal and professional goals and effectively handle life’s daily challenges. We help people make informed decisions and direct people to resources in areas such as: caregiver support, grief, parenting and basic budgeting. We also help people enhance their skills in: leadership, communication, conflict resolution and career growth. Legal/financial consultation and referral services. When legal and financial questions or challenges arise, Continuum EAP has a cooperative legal/financial program to help. You can obtain expert consultation on issues such as: divorce and legal separation, child support, bankruptcy, elder care obligations and other financial concerns. 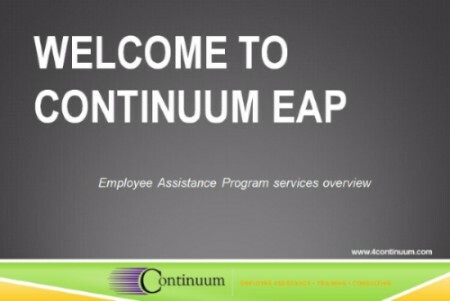 Contact Continuum EAP at 402-476-0186 / 800-755-7636 or easpecialist@4continuum to initiate the above services.